There is Soviet Great Russia and there is the Soviet Ukraine. And besides them there is also another, little-known state, namely, Gulyay-Polye. This is ruled by the headquarters of a certain Makhno. To start with, he had a guerrilla detachment, then a brigade, then, apparently, a division, and now all this has been repainted almost into a special insurgent ‘army’. Against whom are Makhno’s men rebelling? This question needs to be given a clear answer – an answer in word and in deed. Makhno and his closest co-thinkers consider themselves Anarchists, and on this basis they ‘reject’ state power. So then, they are enemies of the Soviet power? Obviously, since Soviet power is the state power of the workers and working peasants. But the Makhnovites cannot bring themselves to say openly that they are against Soviet power. They dissemble and prevariate: local Soviet power they say they recognise, but they reject central power. But all the local Soviets in the Ukraine recognise the central power which they themselves have elected. Consequently, the Makhnovites actually reject not only the central Ukrainian authority but also the authority of all the local soviets in the Ukraine. What then do they recognise? They recognise the authority of the Gulyay-Polye Makhnovite soviets, that is, the authority of a circle of Anarchists in the place where this has temporarily succeeded in establishing itself. This is actually the entire clue to the political wisdom of the Makhno move ment. However, the Makhnovite ‘army’ needs cartridges, rifles, machine-guns, artillery, trucks, railway-engines and money. All these things are concentrated in the hands of the Soviet power, being produced and distributed under its direction. Therefore the Makhnovites have to turn to that very power which they do not recognise, in order to ask for money and cartridges. But, since the Makhnovites quite justifiably fear that the Soviet power might deprive them of everything without which they cannot live, they have decided to secure their independence by seizing the great riches of the country, so as then to enter into ‘treaty’ relations with the rest of the Ukraine. In Mariupol uyezd there is much coal and grain. But since the Makhnovites are sitting on the railway branch-line from Mariupol, they are refusing to allow the coal and grain to leave except in exchange for other supplies. It has come about that, while rejecting the ‘state power’ created by the workers and peasants of the whole country, the Makhnovite leadership has organised its own little semi-piratical power, which dares to bar the way for the Soviet power of the Ukraine and ofall Russia. Instead of the country’s economy being properly organised according to a general plan and conception, and instead of a co-operative, socialist and uniform distribution of all the neces sary products, the Makhnovites are trying to establish domina tion by gangs and bands: whoever has grabbed something is its rightful owner, and can then exchange it for whatever he hasn’t got. This is not products-exchange but commodity-stealing. The Makhnovites shout: ‘Down with parties, down with the Communists, long live non-party sovietsl’ But this is actually a miserable lie. Makhno and his companions-in-arms are not non-party people at all. They are all of the Anarchist persuasion, and send out circulars and letters summoning Anarchists to Gulyay-Polye so as to organise their own Anar chist power there. If they hoist the ‘non-party’ flag, this is only in order to throw dust in the eyes of the most benighted and backward peasants, who understand nothing about parties. Actually, the ‘non-party’ flag serves as the best possible cover for kulak elements. The kulaks do not dare to admit openly that they belong to the party of the Black Hundreds, for they fear they would be punished for that. Therefore they are most willing to make a show of being non-party. At present the SRs, the worst section of the Mensheviks, the Cadets, and all counter-revolutionaries in general who find it too dangerous to appear in public in their natural guise take cover behind ‘non party-ness’. In this respect as in all others, the Makhnovites are no different from the Grigoriyevites; Grigoriyev also rebelled against the central authority in the name of local non-party soviets, that is, against the organised will of the whole working class, in the name of individual kulak groups and bands. It was not accidental that Grigoriyev, when he raised the banner of savage, pogrom-making mutiny and set out to exterminate the Communist, called on ‘baiko’ Makhno to conclude a pogromists’ alliance with him. It is true that Makhno declined. But not at all for reasons of principle. At the Anarchist congress at Gulyay-Polye Makhno openly called for revolt against the Soviet power. If he did not revolt together with Grigoriyev, this was only because he was afraid, evidently realising the complete hopelessness of an open revolt. Makhno’s ‘army’ is guerrilla-ism at its worst, although there are in it quite a few good rank-and-file fighters. No hint of order and discipline is to be found in this ‘army’. There is no supply organisation. Food, uniforms and ammunition are seized wherever they happen to come to hand, and they are expended in the same careless way. This ‘army’ also fights when it feels like it. It obeys no orders. Individual groups advance when they can, that is, when they encounter no serious resistance, but at the first firm push from the enemy they scatter in all directions, surrendering stations, towns and military equipment to an opponent small in numbers. The blame for all this lies wholly with the muddle-headed and dissipated Anarchist commanders. In this ‘army’, commanders are elected. The Makhnovites shout raucously: ‘Down with appointed commanders!’ This they do only so as to delude the ignorant element among their own soldiers. One can speak of ‘appointed’ persons only under the bourgeois order, when Tsarist officials or bourgeois ministers appointed at their own discretion commanders who kept the soldier masses subject to the bourgeois classes. Today there is no authority in Russia but that which is elected by the whole working class and working peasantry. It follows that comman ders appointed by the central Soviet Government are installed in thcir positions by the will of the working millions. But the Makhnovite commanders reflect the interests of a minute group of Anarchists who rely on the kulaks and the ignorant. The anti-popular character of the Makhno movement is most clearly revealed in the fact that the army of Gulyay-Polye is actually called ‘Makhno’s Army’. There, armed men are united not around a programme, not around an ideological banner, but around a man. It was exactly the same with Grigoriyev. In the Soviet Ukraine and in Soviet Russia regiments and divisions are weapons in the hands of the working class as a whole. In the Gulyay-Polye state the armed detachments are weapons in the hands of citizen Makhno. We have seen what this leads to. The private ‘army’ of Ataman Grigoriyev first went along with the Petlyurists, then caine over to the Soviet power, then, led by Grigoriyev, it rebelled in the name of Grigoriyev himself. Armed masses, ignorant and deceived by the ‘non-party’ slogan, become a blind tool in the hands of adventurers. Such is the Gulyay-Polye state and the ‘army’ of Gulyay Polye. Scratch a Makhnovite and you will discover a Grigoriyevite. But most often there is no need even to scratch him: a frenzied kulak or petty speculator who barks at Communists frankly gives himself away. Soviet power is the dictatorship of the working class, which has transformed state power into an instrument of socialist reconstruction. At the same time, Soviet power has to protect the socialist country from the rabid onslaughts of the bourgeoisie. 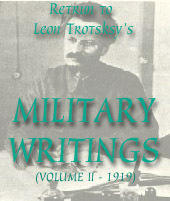 Is it thinkable in such a situation to permit on the territory of the Soviet republic the existence of armed bands which form themselves around atamans and Batkos, bands which do not recognise the will of the working class, which seize whatever they like and fight with whomsoever they choose? No, it is time to finish with this Anarcho-kulak debauchery, to finish with it firmly, once and for all, so that nobody will ever want to indulge in such conduct again.